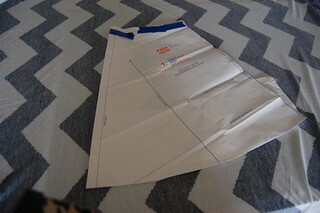 Shorten the skirt pattern piece by 6″ to cut the overlay. I’m working with view B in this case. 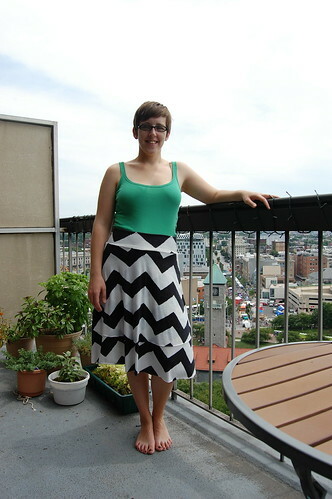 I cut the skirt as directed, then cut the overlay pieces about 6″ shorter. To figure this out, I used my little hemming measure to draw a line on the pattern piece, and then carefully folded/smushed the pattern paper on the line, and cut the overlay pieces. You could also cut a second pattern piece with newspaper or tracing paper, but that seemed like a lot of work. I don’t even pin these pieces down, I just sort of hold them steady while I zip around them with my rotary cutter. Here you can sort of see how I folded the pattern piece to make the overlay. From there I sewed up the sides of the bottom and overlay (keeping them separate) and then simply held the bottom and overlay together and stitched them to the waistband. I don’t have a serger; I’ve used a zigazag in the past, but this time I used an overcast stitch. I lined up the cut edge of the fabric with the edge of the presser foot and stitched away. Worked like a charm. Once I had the whole thing sewn together, I laid it out flat (this requires some shaking and patting) and carefully evened up the hems, as for some reason the bottoms of the skirt pieces are never the same length. It’s easy to fix, though. 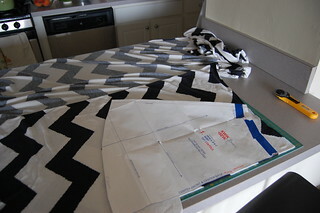 The pattern calls for hemming the raw edges. Last time I zigzagged them after trimming, but this time I just left them be. They’ll roll a little bit, which I like – this is meant to be a casual skirt, not something I’ll wear to work. Skipping that step also means that you can make this skirt in a couple of hours, if that, which is really wonderful. Here I’m trying to preserve as much of the fabric as I can. It’s so wide that it didn’t make any sense to me to fold the fabric in half. Also you can see that I threw caution to the wind and cut with fabric folded wrong sides together. GASP. In total I used about 2 2/3 yards of the 4 yards I purchased. Rather than folding it exactly in half, I folded it over just enough to fit the pattern pieces. So, in addition to the leftover yardage, I have another yard or so of the portion that I cut from that’s a decent width. With my 40% off coupon, the final cost for this project was about $16! Pretty excellent if you ask me.